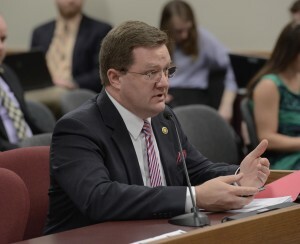 As the Missouri legislature grapples with chronic budget shortfalls, lawmakers continue to look at plans to fix the problem. While the Republican majority looks to make cuts to programs and roll back tax credits, the Democratic minority complains about an unjust and outdated tax structure. Missouri has the 4th largest House of Representatives and the 10th most number of school districts, while it ranks 18th in population. The state House has 163 members, who represent roughly 37,000 residents each. A proposal to reduce the chamber’s size to 103 members by 2020 was introduced in 2011. Dixon thinks lawmakers should look at restructuring government before cutting services as a start to dealing with the state’s financial troubles. Meanwhile, measures aimed to reduce Medicaid costs, which many Republicans consider the biggest driver of spiraling costs, are floating through the legislature. Often, those proposals call for low income recipients to pay fees and co-pays. One Senate proposal would cut corporate taxes as a means to spur business growth, while it would also reduce tax credits in order to recover $149 million in revenue. Dixon thinks the legislature should consider reducing the size of government itself before taking away credits that people can earn against the taxes that they pay, or before lowering corporate taxes when the state could be below the optimum level of generating more revenue. Dixon’s introduced cost saving legislation in the past. One of his proposals would have allowed two adjacent counties to hire and share a single prosecutor with voter approval. Before more cuts are made to state programs and services to shore up the budget, Dixon would seek to trim the expanse of government infrastructure.